Disney’s master plan for the the new Star Wars universe is coming together. List leaked from within Hasbro has shown a likely outline for what major projects we can expect from now ’til 2020 including a Boba Fett film, and two suspicious candidates for other films. Creative teams have also been revealed for some of these projects including a surprise announcement of a young filmmaker whom The Force must truly be with because – he’s wring and directing Episodes VIII and IX! 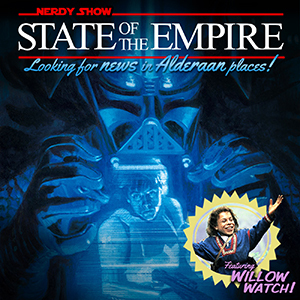 Join, Cap, Hex, Doug, and Ghostbusters: Resurrection‘s Mike Wall as we scour the universe for the most critical and telling Star Wars news bytes as well as offer up our theories on what the “Solo” and “Red Five” films might really be about, say goodbye to Star Wars: Attack Squadrons, hypothesize what a Lando solo film directed by Michael Bay might be like. State of the Empire is now on YouTube!